An impressive collection of eight signature championship courses designed by some of the world’s leading architects are woven together with warm southern hospitality and a mild climate, creating picture-perfect golfing! The Gulf Shores is known for its 32 miles of scenic beaches and endless family-friendly activities, but your vacation does not end there. Join us on a journey as we unwrap the best of this golfing destination, a hidden gem of verdant green and pristine championship courses along the beautiful coastline on the Gulf of Mexico. True southern charm and hospitality welcome you to the peaceful and serene Craft Farms, Alabama’s only Arnold Palmer Signature Design. The 18-hole Cotton Creek and Cypress Bend courses challenge golfers at every level as they weave through a serene coastal landscape just minutes away from Fort Morgan and the white-sand beaches of Gulf Shores. The plantation-style clubhouse promises a true country club experience with excellent on-site amenities and a casual bar and grill to relax in after your game. The Cotton Creek Course is the longer of Craft Farm's two Arnold Palmer designs, a true championship course laid out to challenge rather than intimidate. The course features tree-lined rolling fairways, large undulating greens, Southern Hardwoods and well-positioned bunkers with water framing 12 of the holes. This is a course that is very playable for all skill levels and remains true to its Palmer design. Cypress Bend is the perfect complement to Cotton Creek. An architectural masterpiece featuring staggered tee boxes, sprawling bunkers, wide fairways and year-round lush conditions. Rated 4½ stars by Golf Digest, Cypress Bend offers a dramatically different golfing experience to Cotton Creek with a unique system of lakes coming into play at nearly every hole. A little shorter than its sister course, Cypress Bend requires precision and skill. Masterfully designed by former U.S. Open Champion Jerry Pate and perfectly placed on a secluded strip of land bordered by the Gulf of Mexico and Bon Secour Bay, this West Indian style resort lies right on the white sands in a spectacular and unforgettable setting. Ranking among the top courses along the Gulf Coast and recently listed on Golf Digest’s ‘America’s 100 Best Public Golf Courses’, Kiva Dunes Golf Club is an unmatched Gulf Shore golfing experience. A full-service clubhouse and 3,000 feet of private beach complement the experience. The course combines scenery with strategic shot-making as it meanders through sand dunes, lakes and natural wildlife areas. Featuring wide fairways with bunkers, scrub oaks along the edges and the best six holes closely hugging a canal. The wind direction on Kiva Dunes seems ever-changing often adding a slight plot twist to your game. Seek out the finer things in life at Earl Stone’s finest creation, The Peninsula. Nestled alongside the Bon Secour Wildlife Preserve on 820 secluded acres, this 27-hole championship course is rich in nature, wildlife and scenic beauty. An unrivaled golfing experience on Alabama’s Gulf Shores. Rated 4 ½ stars by Golf Digest and selected as ‘one of the most memorable and enjoyable’ courses in the southeast, the Peninsula charms you on each of its 3 nines with chilled apples, refreshing ice cold towels and spectacular golf. A practice area with target greens, chipping green, practice bunker and a 10,000-square-foot putting green is a good place to get your confidence going! The Peninsula offers three distinctive nine-hole courses – the Marsh, the Lakes and the Cypress, all masterfully designed for golfers of all skill levels. Boasting 7,000 yards of generous Bermuda grass fairways winding through live oaks, cypress, white-sand bunkers and 30 lakes, The Peninsula offers a different playing experience time after time and never fails to impress. Course length: blue 6,907 yards; white 6,358 yards; red 5,191yards. Glenlakes Golf Club offers two distinct courses with stunning views and challenging play for golfers of all skill levels. Regarded as one of the Gulf Coast’s premier facilities with good value, this 27-hole championship layout lies inland in the town of Foley. Warm up on the exceptional Glenlakes practice facility with separate chipping and putting greens or book a lesson with a pro! A Devlin Von Hagge layout, the 18-hole, links-style Vista Dunes is 6,938 yards, featuring wide rolling fairways, strategic mounding, extensive bunkering and large undulating greens. 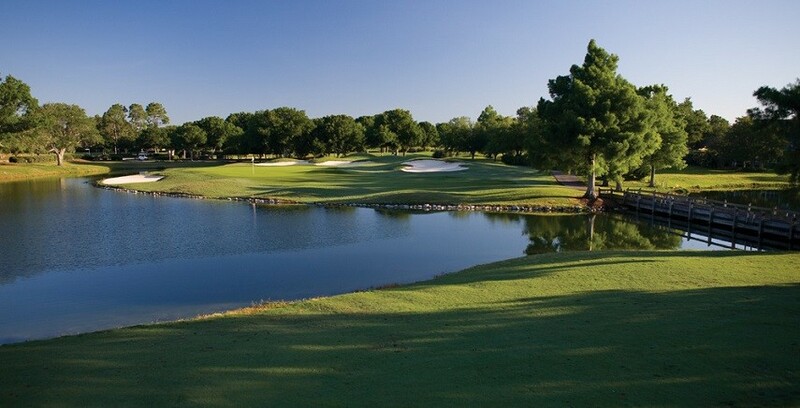 The Lakes is a 9-hole resort style 3,056-yard course that is fun for beginners. The generous, well-groomed fairways and greens feature water on six of the nine holes and multiple tee positions allow for repeat play at an affordable price. End your game in comfort at the ‘Bunker Café’ in the clubhouse. Course length: gold 6,950 yards; blue 6,350 yards; white 5,900 yards; red 5,150 yards. Another captivating Earl Stone creation lies a little further north in the small, vibrant town of Fairhope on the eastern shores of Mobile Bay. Rock Creek is an 18-hole championship course, a stunning landscape of tall pines and hardwoods set in some of Baldwin County’s highest elevations overlooking wetlands and the Rock Creek basin. As one of Gulf Shore’s more challenging courses, Rock Creek presents a true test for golfers – one that low handicappers won’t want to miss! The course stretches 7,000 yards and features rolling terrain with unique, natural elevation changes, numerous doglegs and natural hazards. In addition to world-class golf, Rock Creek offers a full-service golf club, award-winning restaurant and certified golf instruction resulting in many awards, accolades and a consistent rating of 4 ½ stars by Golf Digest. Golf Digest’s ‘4-Star Best Places to Play’ award goes out to another of Earl Stone’s finely sculptured courses, TimberCreek Golf Club, a 27-hole championship course in the town of Daphne on the eastern shores of Mobile Bay. The unique layout meanders through a forest of flowering Magnolias, Dogwoods and Pines as well as the wetlands of D’Olive Creek and promises a strategic challenge for golfers of all skill levels. The course layout includes three nine-hole courses, Magnolia, Dogwood and Pines, all boasting well-groomed fairways and greens. Magnolia has the most elevation changes and wetland areas, providing the toughest test of all the courses, Dogwood is the shortest course through with somewhat bumpy terrain offering great variety and Pines is the easiest with TimberCreek’s best hole at #7. A worthwhile play just a stone’s throw from Gulf Shores. Get the best of both worlds at Arnold Palmer’s signature course, Lost Key in Perdido Key. Lost Key was the first golf course to earn the ‘Silver Signature Sanctuary’ award from Audubon International which protects the natural resources of the area. Situated between Old River and the white sands of Perdido Key, Lost Key has a wild, barrier island feel as the course winds its way through the lush natural vegetation with cart paths of natural, coquina shells. At Lost Key ‘The Experience is Everything’! Narrow rolling fairways, tricky green complexes and beautifully crafted and contoured greens offer a unique visual and strategic playing experience for players of all skill levels. A public course with the amenities, hospitality and service of the finest private club. The sheer beauty and challenge of the course is sure to entice you back for more! 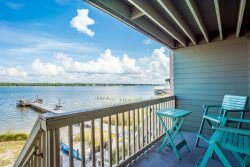 Flip Flop Vacations offers Gulf Shores vacation rentals for every budget. 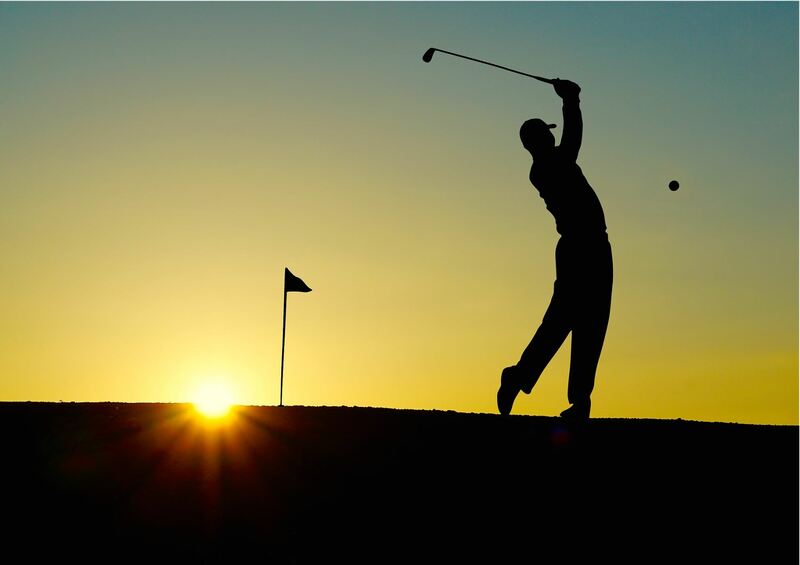 Our affordable properties are just a stone’s throw away from the gulf shore's best golfing experiences. Your Gulf Shores golfing vacation begins right here with our easy, online booking process and an unrivaled selection of condos and homes.